The creek mouth narrows where it meets the sea. 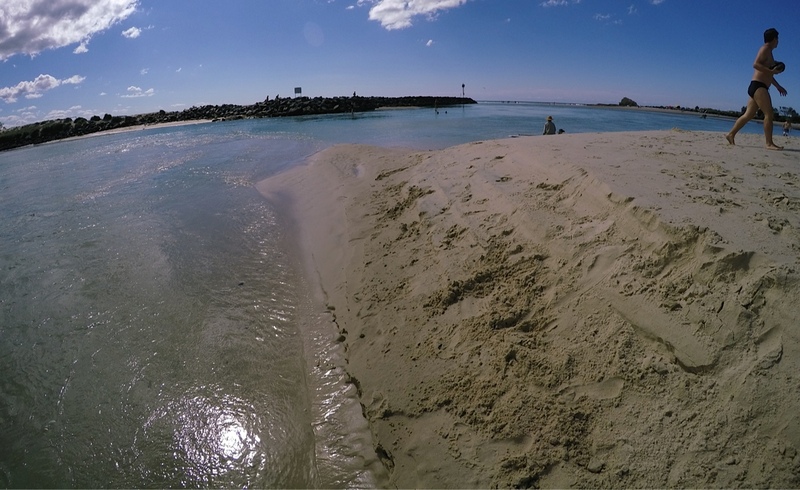 Winter sands gather and want to move the Currumbin Creek mouth north, but the man-made rock walls resist its flow. So the creek slowly, slowly closes. Soon the sand dredge will arrive to open it again, sucking, pumping, piping and spitting the sand to a new beach. The Wattle blossoms with their sweet wintery scent are almost spent. People start talking about Christmas. Birds begin to gather threads for their nests. Sticks, string, leaves. This year we found a Noisy Miner, selecting fibres of purple wool from a garment drying on our verandah. The chip, chip of the first baby birds sounded this week. And the pair of Wood Ducks that nest each year in our gardens has returned. One year they nested in a planter box on the balcony above ours. When it came time for the chicks to leave, mother duck quacked early one morning from the concrete driveway below. Quack! Quack! Quack! Ducklings lingered on the edge of the concrete planter box, hesitant, teetering, chirping feverishly. Quack! Quack! Mother Duck called. Then a waterfall of ducklings began the descent, free-falling six metres to the pebble-textured concrete. Momentarily, each duckling lay splayed on the ground, then shook, stood and waddled on new legs towards a new life. And the birds sing on. Lively sounds of a new season where life expands into its perfect alignment. 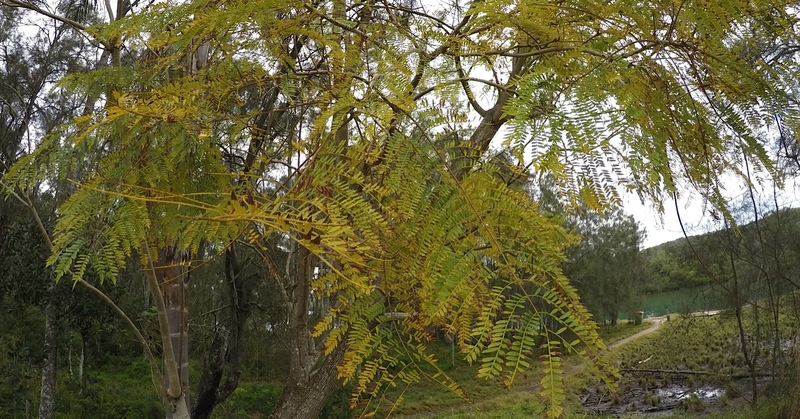 Jacaranda leaves turn yellow preparing for lilac blooms. The post’s main photo shows the narrow mouth of Currumbin Creek from a distance. This photo shows the estuary’s narrow mouth from sand level with the man-made rock wall in the background. 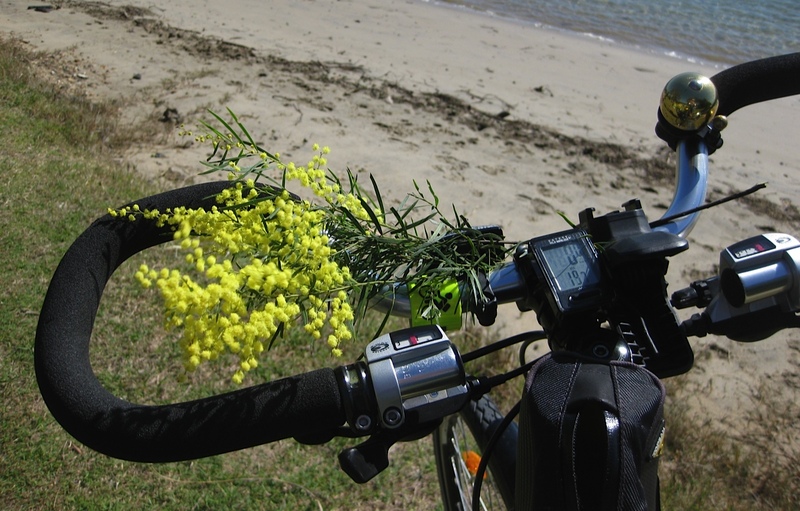 Winter wattle from early August bringing its wintery scent to my handlebars. FOOTNOTE: The phrase, “the land speaks” is attributed to Jackie French, Senior Australian of the Year for 2015 and author of a wonderful book entitled Let the Land Speak. It is a wonderful interpretation of how the land itself has shaped Australia’s history and why we must listen to it. The book was published by Harper Collins in 2013. That’s so true Jane. I definitely wouldn’t have heard the birdsong by the creek if I’d been whizzing along in a car. On a bike, the senses are alive. There’s less to interrupt the inherent connection we share with the natural environment. I love it! Thanks Jen. I’m glad you enjoyed it! Loved this post, Gail. It reminded me of why I love the Gold Coast so much! The soundtrack was brilliant. I’ve been looking at “Booktrack” and wondering if music would be a distraction to reading but it wasn’t in this case – it added to the experience. I’m happy to know it worked in well Gina. I had contemplated it before I posted, wondering how it would be. Then I thought that each reader can decide if they play it before, during or after reading the post. So plenty of options for everyone. Have a wonderful day on the GC! I agree Gina, the soundtrack was a wonderful complement to the evocative description of Spring on the Gold Coast. What a great idea to include it in this post. The ‘lace-like frames’ of the jacaranda tree leaves and the purple blooms that followed brought memories of exam time. I remember being told when I came to Queensland that If you haven’t begun studying by the time the jacaranda blooms you’re in trouble… That was, and probably still is, the accepted wisdom. Ahh, Jackie French, such a wise elder who reminds us we all bear responsibility for the ‘web of life’ of which we are a part. You have a fine and loving eye for the rhythms of the seasons Gail. Thanks for a great post. Thanks Robyn 🙂 It’s lovely to share them. Spring will be in full swing for you Andrew! Safe travels! Thanks Paula. It’s great to hear about the Spring signposts from where you live. Some similar, some different, all changing. It was such an interesting collection of sounds all in the one small space. Somehow, the airplane and traffic noise made the birdsong even more beautiful. Some say we don’t have seasons here in the sub-tropics. The changes are subtle. So it was interesting to reflect on what denotes the turning of winter into spring. I loved the mention of azaleas, harbingers of springtime in RI. We have a lovely area in our town where one of the university professors planted azaleas for his wife when he first married. He died many years ago at age 100 but his property is open to the public. I have many lovely photos of the Kinney Azalea Property. I use one of them as the header for my blog.Another post waiting to happen. That’s a beautiful association to have with azaleas – such a wonderful story. Can’t wait to see the photo!